One of three donation checks – a total of 17,000 euros were donated by Schaeffler Automotive Aftermarket headquarters in Langen, Germany. An additional 5,000 euros are coming from the Aftermarket region North America (USA) and 3,500 euros from the region Asia-Pacific. Pictured (from left) are Zelna Pietersen, Human Resources Manager, Schaeffler South Africa (Pty.) Ltd., Dr. Marietjie van der Merwe, Director Khayalethu Youth Centre, Marshall Myburgh, Managing Director, Schaeffler South Africa (Pty.) Ltd., and Philipp Erasmus, General Manager Automotive Aftermarket, Schaeffler South Africa (Pty.) Ltd.
Schaeffler takes its commitment to social responsibility seriously. The company focuses on helping in three core areas – Education and Science, Health and Social Affairs, Sports and Culture. And its Automotive Aftermarket division makes an important contribution to this as well and is donating a total of 25,500 euros this Christmas. The donation is made up of 17,000 euros from the division headquarters in Langen, Germany, 5,000 euros from the Aftermarket region North America (USA) and 3,500 euros from the region Asia-Pacific. The Khayalethu Youth Centre has been helping boys living on the streets of Port Elizabeth for over 20 years and allows these poor, needy children to find their way back to a normal life. There are currently 35 boys living at the center between the ages of six and 21. Besides individual and comprehensive care, the guiding principle of “Education as a Chance” is paramount to the charity project. With its donation, Schaeffler is supporting the construction of a new building, which after completion will bear the name “Schaeffler: Space for Learning Centre”. “The commitment and passionate dedication of the staff to give these children a completely new perspective on life and to allow them to choose their own career, impressed us a lot,” said Michael Söding, CEO of the Automotive Aftermarket division at Schaeffler. 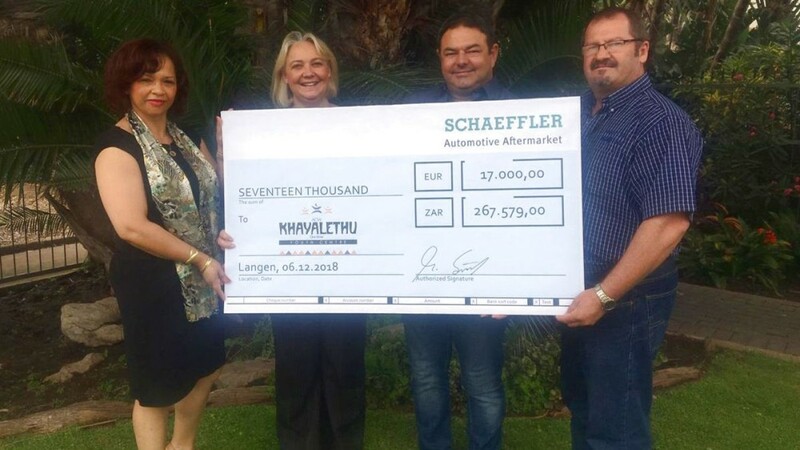 “Education is without a doubt one of the decisive factors for the development and future of society, and should be supported in every way possible.” The donation was presented on his behalf to Dr. Marietjie van der Merwe, Director of the Khayalethu Youth Centre, by Marshall Myburgh, Managing Director, Schaeffler South Africa (Pty.) Ltd., and Philipp Erasmus, General Manager Automotive Aftermarket, Schaeffler South Africa (Pty.) Ltd.